Welcome to our summer edition of the Burst, and with the change of seasons the hope that rain will finally come to outback NSW and QLD to break this dreadful drought. Members can be very proud that with your generosity and a contribution from the Club we have so far raised $11,071.80, all the monies raised will be donated to the Buy a Bale drought appeal to assist farmers in need. This appeal is just one of the many charitable contributions that your Club has made to the Community, in 2018 the Club has contributed $152,502.72 to a variety of charitable organisations, a full list appears on Page 13 in this edition of the Burst. This monetary donation does not include the hours of work put in by our Club Community Group led by Lynda Lake in raising money by way of BBQ’s, Crazy Whist nights, stalls etc. ; this enables them to carry out all the great work in providing gift Hampers for Mother’s Day, Christmas etc. ; at the local Nursing Homes, or organizing for the residents to visit the Club for Bingo and morning tea, thanks ladies. It would be remiss if I did not mention the Sub Branch who conduct ANZAC Day and Remembrance Day services at the Nursing homes and the many local schools including pre-schools. Members can be justifiably proud of the major contribution that the Club makes in the local community. 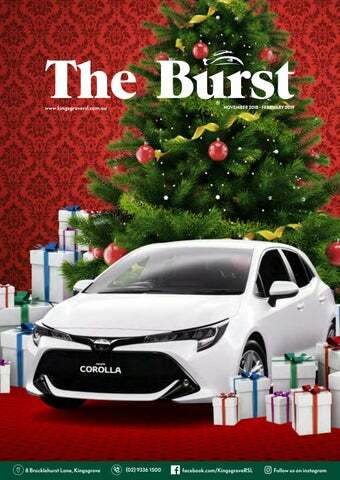 The festive season is a great time to visit the Club with many popular promotions, Melbourne Cup Day, Carols by Candlelight, Senior Citizens Christmas Lunch, Star Tributes Night and of course the great members car giveaway, full details of these promotions and many more appear in this edition. As our elections are on the biennial basis there are no elections in 2019, however that does not detract from the importance of attending the Annual General Meeting on the 26th March at 7.00pm. Being the last edition of the Burst for the year, I would take this opportunity to thank the Board of Directors for their valued input during the year. The Club Management team under the leadership of General Manager Ian Todd and our great staff who have again ensured that members and their guests had an enjoyable time when they visited the Club. From the President, Directors, Management and Staff of Kingsgrove RSL Club Ltd, and the President and Committee of the Kingsgrove RSL Sub Branch. Kingsgrove RSL Club Ltd will be CLOSED on Tuesday 25th December, Christmas Day. Happy Holidays! time for this event as they represented you the member and provided great insight for our future. One such initiative that was approved is the introduction of our Courtesy Bus available Friday to Sunday for both pick up and drop off Check page 20 for details. Your Club once again has a number of great events and promotions starting with our ever-popular Carols by Candlelight on Saturday 24th November with a performance by the Princess and Super Heroes show and the Rock & Soul choir, tickets are $3 for members and will get your child a show bag and a batteryoperated candle. Our 2019 Membership Draw could win you a Toyota Corolla Accent Sport valued at over $20k by simply joining the Club or renewing your membership by 31st January 2019. Check the details and conditions on page 5. Membership renewals will open on Monday 19th November 2018. Saturday 2nd December 2018 come along to our Star Tributes Night featuring entertainment by 70’s Unplugged & Electrified with sounds by Stephen Fisher King starting at 7pm with tickets only $50 (all inclusive) tickets go on sale Thursday 1st November. Join us for our Senior Citizens Christmas Lunch on Tuesday 4th December at 12.30pm. Tickets are only $15 featuring the sounds of Simon Gillespie. Tickets on sale Thursday 1st November. Our Christmas Ham Raffles are always a great hit and this year will be no exception with 101 ½ leg hams being given away on Friday 7th December and again on Friday 14th December. Tickets are only $1.00 and are on sale from 3pm. Draw to commence at 5.30pm. There will be 202 half leg hams to be won over the two draws. Monday 24th December will see our Seafood Raffle take place in time for Christmas. Tickets are $1.00 and are on sale from 4.30pm. Draw to commence at 5.30pm to win an array of oyster’s, prawns, crabs and meat trays. CLUB DRESS RULES NOTICE To maintain the high standard enjoyed in our Club, we request the dress rules be abided by at all times. Thongs for both male and females are not permitted after 7:30pm each day. Hats can be worn on the Parkview Terrace till 6pm, Kingsgrove RSL cares about protecting your skin from Australia’s harsh Sun. Appearance must be clean, neat and tidy at all times, obscene or offence language on clothing will not be tolerated at any time. See reception for full dress rules. 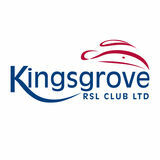 ANNUAL GENERAL MEETING of Members of the K I N G SG ROV E RS L C LU B LIMITED Will be held on Club’s premises situated at Memorial Park, Brocklehurst Lane, Kingsgrove, on Tuesday 26th March 2019 at 7pm. Notice of business and all resolutions proposed to be dealt with at the Annual General Meeting, shall be handed to the General Manager on or before 12th March 2019 and in the case of Special Resolutions on or before 26th February 2019. 2019 Subscriptions are payable from Monday 19th November 2018 All subscriptions must be paid by January 31st 2019 You are advised that the Club, in accordance with the Registered Clubs Act and Clubâ&#x20AC;&#x2122;s Constitution will enforce this ruling relating to the payment of Members subscriptions. All Sub Branch members applying for or who hold a muti year Club membership will still be required to renew their Sub Branch membership fees each year. Check at reception for details. In 1919, South African Sir Percy Fitzpatrick proposed a two (2) minute silence to Lord Milner. This had been a daily practice in Cape Town from April 1918 onward, since being proposed, within weeks it had spread through the British Commonwealth after a Reuters correspondent cabled a description of this daily ritual to London. People now observe a one (1) or more commonly a two (2) minute moment of silence at 11.00 am local time. It is a sign of respect for in the first minute the roughly twenty (20) million people who died in the war and in the second minute dedicated to the living left behind, generally understood to be family and friends left behind. THE HISTORY OF THE UNKNOWN SOLDIER On the second anniversary of the Armistice on the 11th November 1920 the commemoration in the UK was given special significance when it became a funeral, with the return of the remains of an unknown soldier from the battlefields on the Western Front. An Unknown soldier was interred with full military honours in Westminster Abbey in London and at the Arc de Triumph in Paris. Most other Allied nations adopted the tradition of entombing an unknown soldier over the following decades. Hall of Memory. Remembrance Day ceremonies were conducted simultaneously in towns and cities all over the country, culminating at the time of the burial at 11.00am and coinciding with the traditional two minutes silence. T&C’s: WIN 1 of 5 x $30 Ultimate Kids Gift Cards (valid for 12 months and available to be used at 5 Retailers; Amart Sport, Cotton On Kids, Dymocks, JB Hi-FI, Rebel). Entries to be returned to Kingsgrove RSL Club reception by 10:00pm Friday 14th December 2018. All winners will be contacted by Phone on Monday 17th December 2018. By entering this competition you allow Kingsgrove RSL to showcase your entries and take photos of the winners to be announced/posted on social media, if you do not wish for this to occur please do not enter. Open for all children aged 12 years and under. All entries must be attached to a Kingsgrove RSL Club Member # to be eligible to win. You’re invited to visit with Santa and commemorate the magical moment with a FREE PHOTO. BOOKINGS ESSENTIAL through Club Reception or call 02 9336 1500. Exclusive to Kingsgrove RSL Club members & limited to spots between 11am-2pm. Guardian understands every goodbye is different. Yoga MONDAY M O R N I N G F R O M 10 A M Contact Bernadette on 0419469152 to book in your spot. improving her balance and even her memory. No matter what your situation, gentle yoga exercise can adapt to your needs and abilities. It can help in the prevention and control of common health problems. She says she has strategies to stay calm and peaceful and this is helping her navigate the transition from a family home to life in a retirement village. IN 2018, YOUR CLUB DONATED OVER 150K TO OUR LOCAL COMMUNITY! This year, Kingsgrove RSL Club with the support of our members and the Board, are proud to have awarded $152,502.72 to our local community groups, schools, sports clubs and charities who are connecting people and creating positive changes within in our local communities. GALLIPOLI SCHOLARSHIP 2019 Up to 7 Scholarships worth $6000 each awarded to students attending their first year of University or TAFE studies in a degree, diploma or advanced diploma course. Ian Todd, General Manager, Kingsgrove RSL Club Grant recipients. Through the ClubGRANTS funding program Kingsgrove RSL Club has been able to help build more vibrant and inclusive communities; Enabling local schools and to provide for student scholarships, purchase prizes and gifts for raffles, cover venue and equipment hire fees for student events. With the support of Kingsgrove RSL staff voluntary efforts and sponsorship, your Club has also been able assist and fund local community groups, sports clubs, charities and non-for-profit organisations to improve community services, health services, welfare services, manage community centres, build better grounds and establish civic centric programs to encourage strong and healthy societies. This year your Club with the support of patron donations, have the opportunity to assist our Australian farmers and their families withstand the suffering caused by natural disasters and drought. We are proud to have so far given $11,071.80 of financial support to as our rural communities through the Rural Aid program and the Buy a Bale campaign. We thank you for your efforts and hope you continue to help us reach our goal of $15,000 in funding for this initiative. Kingsgrove RSL Club believes in empowering people to build strong communities and are always on the lookout for local recipients that meet the criteria of the ClubGRANTS funding program, applicants interested in applying can visit the ClubsNSW website for further details. 200GRM Rump Fillet Steak cooked to your liking, topped with Creamy Garlic Prawns, served with Chips and Salad. Minor draws at 7pm, 7.30pm & 8pm for $100 cash. All tickets go back into the barrel for the major prize of $1,000 Turn up on the night, register your name and wait to win $1,000. Its that simple! This is a tiered promotion available to members in levels Double Diamond, Diamond, Sapphire and Ruby only. Members will be contacted by email or via text message, if opted to receive mail. Members will no long receive invitations via mail unless requested. Six Up Books. Free Bingo to all members ( limit one book per member). Additional books $2. Multiple books allowed. Non-members $2 per book. Poker j 7:30pm Thursday night $1,000 guaranteed prize pool at $7.00 buy in. KINGSGROVE RSL CLUB IS THE BEST SPOT TO WATCH ALL YOUR SUMMER SPORTS LIVE ON THE BIG SCREEN, OPEN DAILY FROM 10AM TILL LATE. *Kingsgrove RSL Club is a ClubSafe venue and is committed to the provision of responsible gambling. Only persons over the age of 18 may place a bet or be in any gaming area. Contact the Responsible Gambling Department or the Gaming Manager on duty for further details. Responsible service of alcohol will be observed at all time and strictly adhered to. METHODS 1. Place jelly crystals in a heatproof bowl. Add boiling water. Stir to dissolve crystals. Stir in 400ml cold water. Refrigerate for 1 hour or until just starting to set (it should have a thick, syrupy consistency). 2. Arrange cake in a 13 cup-capacity serving bowl. Drizzle with brandy, if using. Spoon half the jelly over top. Top with custard. Sprinkle with raspberries and strawberries. Spoon remaining jelly over top. Refrigerate, covered, overnight. 3. Using an electric mixer, beat cream and sugar in a bowl until soft peaks form. Fold through chocolate. Spoon mixture over trifle. Top with raspberries, strawberry quarters. and or grated chocolate Serve. NOTE: You could use leftover fruit cake or pudding in this trifle. You could replace brandy with orange juice. *Responsible service of alcohol will be observed at all time and strictly adhered to. very fitting tribute to our military history, stop and have a look when next you come into the club. On behalf of the Sub- Branch Committee I would like to extend our Best Wishes for Christmas and the New Year to the Board of Directors, Club Manager Ian Todd, the Club Management Team, Office staff, the great Club staff who look after us at our meetings and functions and the Jade Palace who provide the great meals at our luncheons and after the bi-monthly meetings.. To the Sub-Branch Executive, Committee, SubBranch Members, the Women’s Auxiliary and your families may you all have a Merry Christmas, a Happy, Healthy and Prosperous New Year. December. All members of the sporting Clubs along with their partners are welcome to attend so that you can show your support for the Club who provides the funding required to allow everyone involved to participate in their chosen sport at a minimal cost. I look forward to seeing all of you there on the night whilst showing your support to the club and its sporting champions. I would like to take this opportunity to thank the Board of Directors, Management and especially the staff for their support over the year toward the Sporting Clubs. The snooker club has been running very smoothly so far this year , we are averaging 14-16 players for the Friday night competition and currently have 48 financial members. Weather gods have been unkind to the fisho’s in 2018 – many of our outings have been cancelled due to dangerous weather conditions - 2019 has to be a better year. Our Club Championships (A and B grade, Handicapped singles and doubles) are in the final stage with Greg Dwyer and Owen Wong contesting the A Grade final. As weather conditions have made it impossible to fish, a small “get-together” was arranged for Fishing Club members in KRSL’s Jade Palace Restaurant on Saturday 8th September. It was great to see the 20 or so members attending. I would like to invite any Club member that enjoys the game to join us for our Friday night competition (which is handicapped, to make it fair for all). We also run doubles competitions some Fridays depending on the number of players. It is only $5 to join and there is prize money for winners and runners up. I would like to take this opportunity to thanks the committee for all their help so far this year and we hope to see you Friday nights. Whilst thinking of the upcoming festive season we should spare a thought and a prayer for all our Service men and women who are serving overseas that they may complete their tour and return safely home to their loved ones. I look forward to seeing all Sub Branch members at the next General Meeting on the 17th December, dinner and refreshments provided. Our comp teams did very well throughout the year. Congratulations to Michael our new club champion after a well fought battle with Shane. Well done to all comp players for their great effort. We are coming to the end of the year for our social night. Our last night of darts is Friday 30th of November but don't fear we will be back on Friday 11th January 2019. So hope to see everyone then. We will be holding our AGM in February. Don't forget to renew your membership for the year. S P O R T S A D M I N I S T R AT O R Where has 2018 gone? It doesn’t seem that long ago that it was the New Year and now we are approaching the Christmas Festive Season once again. Our social Darts Club is run on Friday night. It’s great to see all our members even some new faces come along and enjoy a night of darts. Congratulations to Leaf, Robert and Michael for joining that exclusive 180 club. One of the hardest and most sought out scores in the game. From all the members of the social Darts Club we want to thank Kingsgrove R.S.L for all their continued support and to all the management and staff for their services throughout the year. Thank you. On behalf of all our dart members wishing everyone at Kingsgrove a Merry Christmas and a Happy New Year. See you all in 2019. The final two outings for 2018 will be held on 13th October (Botany Bay), 3 boats and their crews going out. Fingers crossed it will finally be fish-filled and for once, cooperative weather conditions. Numbers are still being finalised to accommodate those attending the final 3rd to 4th November (Shoalhaven Heads) outing. A separate charter has also been organised to leave from Kiama on the 3rd Nov; 10 people will be “jumping on board” to hopefully catch some “bragging rights”. One of our life members – Jim Hall has been on the sick list and finally on the road to recovery, very much looking forward to returning to his much-loved passion of fishing. Our annual presentation night will be held at KRSL on Saturday 17th November from 7:00pm. For catering purposes, please contact the Fishing President or Secretary (by Monday 5th November) if you wish to attend. A fun night is assured with lots of “surprises” planned. All Fishing Club members are encouraged to attend our AGM held on Tuesday 4th December from 7:00pm; the current committee will step aside and a new committee elected - the 2019 Fishing calendar will be distributed on the night. On behalf of the Fishing Club Committee and members, I would like to wish all KRSL members and their families a very safe, happy and healthy 2019. It is coming towards the end of another year so we would like to wish everyone a Merry Christmas and a Happy New Year. The ladies have been very busy over the last few months preparing for the end of year projects. We deliver Christmas presents to three nursing homes in December and in total there are about 300 presents that we give out. We invite nursing homes and seniors to a Christmas lunch at the end of November and all people attending leave with a present. There are around 65 people who attend on this day. Carols by Candlelight is on Saturday 24th November 2018 and we will be doing a sausage sizzle again, plus we will have a small table with a few of our craft items on it if you would like to purchase small gifts for Christmas, or just come along and say “hello”. At the end of September we held a sausage sizzle at Bunnings Kingsgrove and did very well on the day. We would like to thank the members of the Board and staff who helped us on that day as we could not have done it without you. We would also like to thank the members of the Club that came and purchased their lunch. A couple of the ladies have been knitting coats for the lambs on the farms and next year we are going to do some blankets for the dogs and cats at the RSPCA. Our projects are covering a lot of areas, which is good, as we have no time for boredom. We would like to thank the Club for their support throughout the year so that we are able to do all these things. Thanks to everyone for the donations. The Melbourne Cup luncheon is being held at the Club and some of our members will be attending. Our members are also helping to fill the Show Bags that are sold as part of the Carols by Candlelight celebrations. We invited the NSW President of the Women’s Auxiliary to visit us at the Auxiliary’s September meeting. She was presented with 188 hand-made yellow poppies, as a sign of friendship, to be distributed at the Invictus Games. Other Auxiliaries throughout the State have also been involved in making them. Although a little early, may I on behalf of the Auxiliary, wish all members a Merry Christmas and a Happy and Healthy 2019. Pat Graham President Women’s Auxiliary. Lynda Lake and Yvonne Talbott attended Congress as delegates of Kingsgrove RSL Sub Branch Women's Auxiliary, this Congress was part of the NSW RSL 2018 Annual State Congress that was attended by Sub Branch President Alan Barnes and Secretary John Graham. In August the Auxiliary joined in with the SubBranch at the service and luncheon held to commemorate VP Day which celebrated the end of World War II. All members of the Sub-Branch are invited to attend. will be held on the 3rd Monday of the Month. "2018 Women's Auxiliary Congress in Albury where Linda Hurley, the Patron, presented Lynda Lake a certificate of appreciation for funds raised by Kingsgrove RSL Sub -Branch Women's Auxiliary." We enjoyed the luncheon we attended at Ingleburn RSL Club and are looking forward to another one with Canterbury Hurlstone Park Auxiliary at their Club. WOM E N’S AUX I L I A RY Since our report in the last edition of the Burst the Women’s Auxiliary has been keeping busy. We had great fun attending the Crazy Whist Night in July. Another one was held in October. Do you require the services of a Justice of the peace? The following is a list of Club and Sub Branch officials and members who are JP’s and who are regularly at the Club. Enjoy a light meal and a barista made beverage anytime.